Back in April, Jabee and Thelonious Martin kick started their joint EP compilation project with the release of "Catch That Feeling". 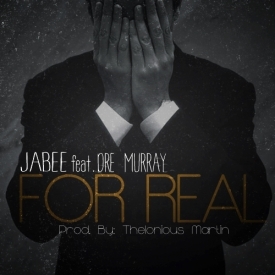 The rapper/producer duo are back with their latest collaborative track "For Real", which features an opening verse and hook-work from Dre Murray. In the process of working their way around Martin's warm and soulful production the two Oklahoma emcees lay down some down-to-earth, blue-collar rhymes. The track will eventually land on Jabee and Thelonious Martin's upcoming collaborative EP which is due out in August. Stream the track below and look out for more cuts from Jabee and Martin leading up to the release of their joint EP. Thelonious Martin produces the lights out on "Mama Got A Hold On Me"
Michael Christmas goes after everybody on "Leonard Washington"